This Fidelity fund has no 12b1 fee and no sales load fee. The fund’s expense ratio is 0.95% per year, which is lower than the average in the consumer discretionary category (1.60%). It also has a yield of 0.14% per year. This yield is considered small for any equity income funds. This consumer discretionary sector equity fund has been managed by John M. Harris since 2007. Prior to October 2006, this fund was known as Fidelity Select Consumer Industries Portfolio, operated under certain different investment policies, and it was compared its performance to a different benchmark. As the top rated fund, Morningstar has rated 3 star rating for FSCPX fund. Based on load adjusted return, this fund has returned 37.70% over the past year and 4.59% over the past five years. The fund has its best performance year in 2009 with 38.12%. Its worst performance return occurred in 2008 with -34.64%. This fund has 4.59% of 5-year average return. Investor will need $2,500 minimum balance for opening the regular brokerage account and $500 for retirement account (IRA) investment for investing in this fund. This best sector fund is available to many investors. Investors can purchase this fund through 57 brokerages, such as Vanguard, JP Morgan, T Rowe Price, Common Wealth PPS, Schwab Retail, Raymond James, ING Financial, Ameritas NTF, Firstrade, Td Ameritrade, UBS Financial Services Inc, etc. This top rated sector equity fund is only available in this no-load class only (FSCPX). As of June 2011, this Fidelity fund has 88 holdings. The top ten holdings are Lowes Cos Inc, Amazon.com Inc, McDonalds Corp, Disney (Walt) Co, Target Corp, Time Warner Inc, News Corp Ltd, Directv, Starbucks Corp and Bed Bath & Beyond Inc. The asset allocations of this fund as of June 2011 are 89.96% in domestic equities, 9.21% in international equities and 0.83% in cash & net other assets. 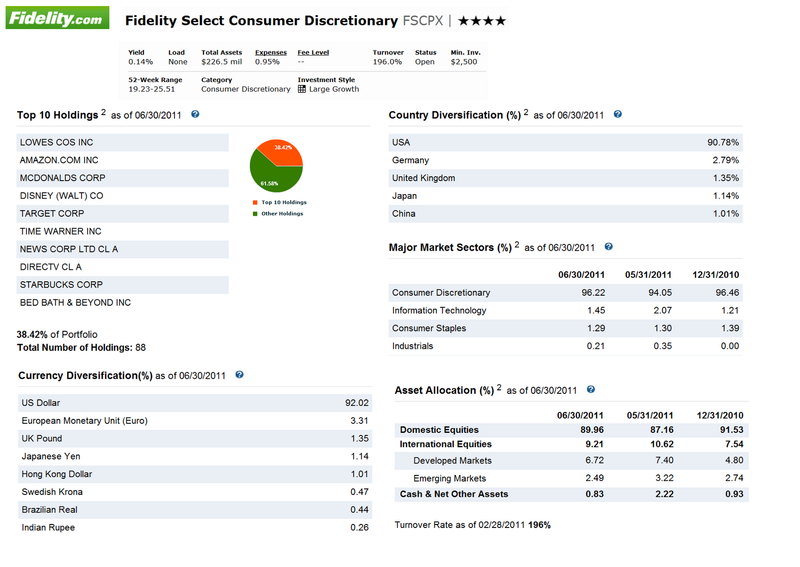 The top major market sectors as of June 2011 are Consumer Discretionary (96.22%), Information Technology (1.45%), Consumer Staples (1.29%) and Industrials (0.21%). And the country diversifications are USA (90.78%), Germany (2.79%), United Kingdom (1.35%), Japan (1.14%) and China (1.01%).